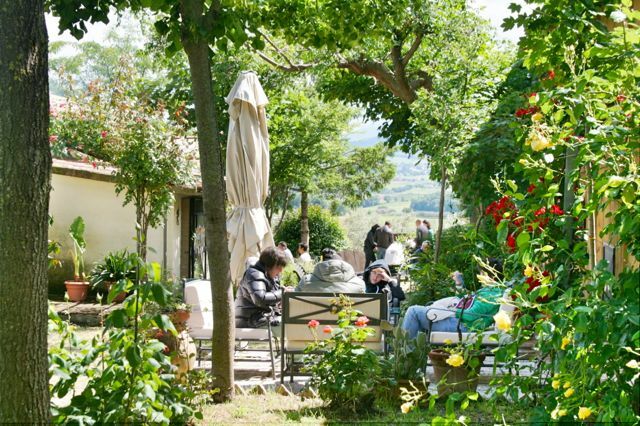 On the last Sunday in May the popular Cantine Aperte (Open Cellars) wine event is held in Umbria. Circumstances usually conspire against me so that I miss Cantine Aperte, but this year I had two friends staying who wanted to go. Of course, I ended up as the designated driver, but this meant that I came back with a good recollection of our day out! First of all you have to buy your glass, €5 buys one that can be used in all the cellars for a tasting. Not all the wineries offer a free tasting and some were very busy. 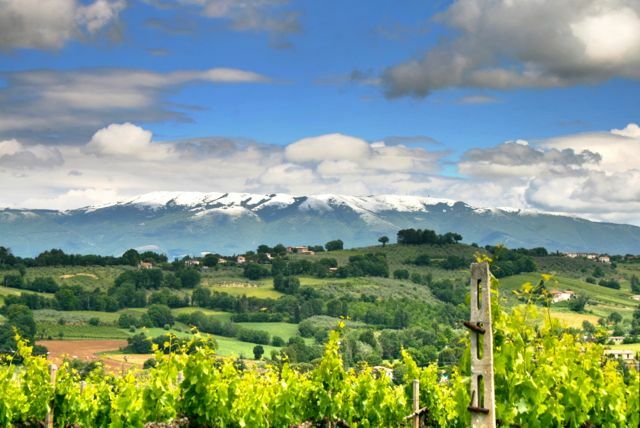 When we arrived at the first cantina, Terre Margaritella, we came in behind a large coach, the queue to buy the glasses to get started was so chaotic and long that we decided to push on to Di Filippo, a few kilometres further south. This winery is accessed by a fairly narrow road and was also very popular, many groups had organised small coaches. To get at the free wine tasting you had to leave your name and wait until called, by now we were beginning to feel a bit thirsty and abandoned the queue to buy a bottle of Montefalco Rosso. Our next stop was Miliziade Antano, this winery is between Montefalco and Bevagna, the wine here was free and there was a porchetta stall. The atmosphere here was quite lively, only slightly ruined by a DJ singing karaoke to the records he was playing! Next we stopped at Fongoli, in San Marco near Montefalco, a relaxed atmosphere prevailed here, possibly because wine was sold by the glass rather than dished out for free. As I didn’t want a whole glass, they were very happy to split it between three. Our budget doesn’t generally extend to quaffing bottles of expensive Sagrantino and we ended up buying two five litre boxes of very good red to take home (some of it was drunk by my companions in the cantina gardens).